BuilderWerks lets you do more! “I can supervise 15 large custom homes instead of 10. $100,000 annually. That's the bottom-line impact just one BuilderWerks system can have. With BuilderWerks’ automatic speech recognition and logical, easy-to-use dictation protocol, you can document, access, and put a hard number on the detailed knowledge your construction superintendents have about ongoing projects. What drives savings like this? Two key factors. 1) Higher productivity: Capturing information by voice is more efficient than doing it by hand. It even beats the fastest shorthand. And computerized transcription and delivery compresses two-plus hours a day of administrative time into 20 minutes or less. 2) Complete control: Compiling punchlist items, noting schedules, and staying in touch with customers is easier and faster with BuilderWerks, so you’ll find you’re happy to do these tasks – better and more frequently. No more phoning, transcribing, handwriting, or retyping to deliver your messages. Just Say It and Send It™. It’s that easy with BuilderWerks. 3) Thousands in documented, hard-dollar savings: Builders once had no choice but to absorb hidden job costs. Not so with BuilderWerks. These costs are now easy to document, and backcharge to subcontractors and vendors, resulting in real-dollar savings that used to be money surrendered on each unit. 4) A powerful management tool: BuilderWerks’ documentation itself – of defects, scheduling decisions, final inspections, and more – provides rich information for appraising superintendents, vendors, and subcontractors. Who performed best? Who would you not want back on a job? Who or what is costing you money every day? That’s all revealed and archived with BuilderWerks. 5) Documentation = Advantage: Written records are the best way to resolve uncertainty and disagreement. Whether within your office or in small claims court, the party with accurate, verifiable, and retrievable information usually heads off problems that could otherwise continue squandering your money, energy, and goodwill indefinitely. 6) Better trend analysis: BuilderWerks makes acquisition of critical job data easy (data formerly lost or unavailable), transforming that information from facts and opinions known only by construction superintendents into an invaluable corporate asset residing on your internal business systems. The information BuilderWerks archives brings new dimensions to identifying benchmarks, planning, and evaluating vendors, subcontractors, locations, managers, model types, and others. With BuilderWerks, you’re in command of all your essential business metrics. And more and better information means you’ll make higher quality decisions. You can provide additional attention to each unit and perform additional or more thorough customer communications and unit inspections, identifying problems earlier, thus making them more manageable – and less costly. And now, you can concentrate the most critical responsibility among your most effective superintendents, and move other personnel (and even management functions) elsewhere. Please call 813-968-2972 or contact us to discuss the benefits BuilderWerks will be able to provide at your firm. We look forward to hearing from you! Includes Nuance Dragon NaturallySpeaking Preferred® Software. Licensed per user voice file. Includes Nuance Dragon NaturallySpeaking Preferred® software; includes Blackberry® 8XXX series cellphone; does not include monthly cellular service charge. Includes Systran Business Translator® Software and Nuance Dragon NaturallySpeaking® Preferred Software. Includes Systran® Business Translator software, Nuance Dragon NaturallySpeaking Preferred® Software; and Blackberry® 8XXX series cellphone; does not include monthly cellular service. BuilderWerks offers new, productive and unique ways to use digital recording, wireless, speech recognition and language translation technology. adaptable to other inspection and reporting requirements. 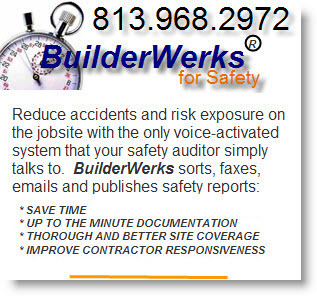 BuilderWerks work flow: Dictate your notes ("punch items") in the field for various types of reports and audiences, and then BuilderWerks (a) automatically turns your dictation into text, (b) organizes the text into e-mails, faxes, and word-processed documents and sends the messages to all your recipients, and (c) stores everything in a worksheet you can update by dictation the next time you're at the site. The data can be customized for insertion into a preexisting construction management software database. help backcharge vendors whose mistakes cost you money. BuilderWerks facilitates acquisition of critical data (data formerly lost or unavailable), transforming it from individual facts known by construction superintendents into an electronically stored corporate asset. 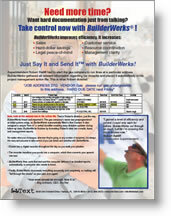 Please call 813-968-2972 to discuss how much time and money BuilderWerks can save your firm. Construction superintendent Robert Ratliff sold a house to a woman who came to his jobsite in Austin, TX. She visited at the urging of a friend who was one of Robert’s customers. That customer told her friend about the quality and frequency of Robert’s updates, dictated and e-mailed daily using BuilderWerks. There was no ongoing construction detail that Robert’s customer couldn’t know the same day. That level of customer service convinced the customer’s friend to buy from Robert. She cancelled her contract for a house in another subdivision, and then purchased a new home from Robert on the spot. BuilderWerks' success has been documented in user interviews and commentary. Video comments from actual users can be reviewed here. BuilderWerks is designed for any communications when you are away from the office. BuilderWerks was developed in and for the rugged workplace environment by IntoText Corp in cooperation with a team of builders, developers, contractors and remodelers. The vision that was brought to fruition was to offer dramatic productivity and management enhancements to the construction, contracting, and site managers who use it. BuilderWerks uses a digital recorder. BuilderWerks can also be used with select cell phones for transmission to a base network or wireless transmissions to local computers for immediate conversion to text and transmission to recipients.